We recommend booking your bounce house as early as possible. Reservations can be made weeks, or months, in advance, but during the summer months, our most popular units are booked up quickly. Take advantage of our wide ranging selection of themes and inflatable types! Whether your child is begging for a dinosaur-themed space walk or you’re excited to surprise your birthday boy or girl with a special Disney-themed combo, it’s better to make your reservation as soon as possible. In the event of bad weather, we work with our customers to either reschedule or issue a refund, so there’s no risk to you by booking early. Our team of qualified technicians will set up your bounce house, but you should have an area picked out beforehand. The average size of our bounce units are about 15’x15.’ For safe operation, all of our inflatables require a three-foot buffer zone on each side, so make sure you calculate this into your measurements. We can either use stakes or sand bags to anchor the bounce house to the ground, which means it can go almost anywhere: driveways, parking lots, and backyards are all appropriate bounce zones. 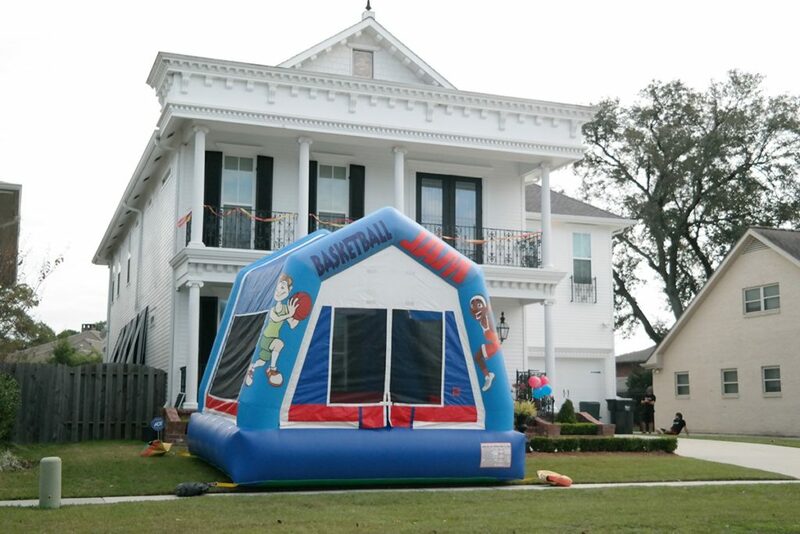 With a bounce unit that measures 15’x15′, up to eight people can bounce at one time, though limitations depend on the ages and size of the partygoers. An average sized bounce house can hold eight children under the age of eight, six children between nine and thirteen, four teenagers, or three big kids or adults. 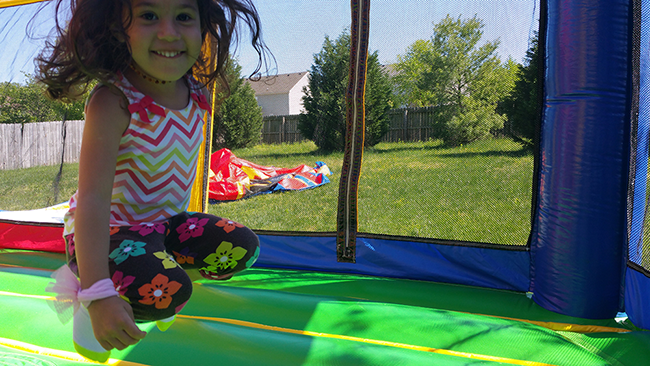 Bounce house setup is quick and easy, taking only 15 to 30 minutes—which leaves plenty of time for fun! 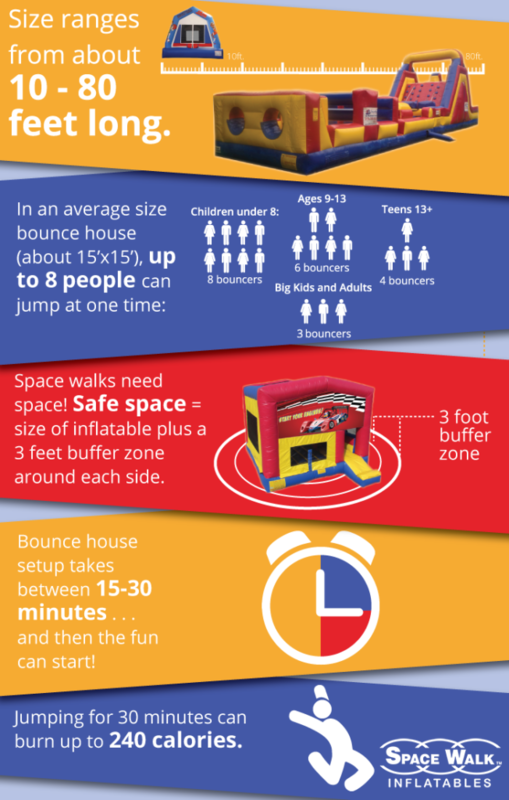 Because jumping for 30 minutes can burn up to 240 calories, bounce houses are not only fun, but also a healthy birthday party activity. With bounce house themes ranging from dinosaurs or pirates to the Justice League or the Little Mermaid, you’ll be sure to find the centerpiece for an unforgettable party!